The Scala2 is a robust, composite, variable speed pump that adjusts performance according to water demand, providing constant pressure to all taps. 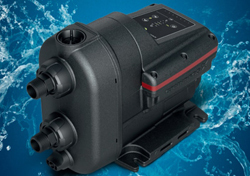 The fully integrated pump includes a motor, tank, sensor, drive and non-return valve in one compact unit that is quick and easy to install. SCALA2 is self-priming, allowing for use from both above and below ground water sources and the water-cooled motor ensures quiet operation.